Located at the Gulf of Papagayo, El Mangroove is a boutique resort that makes for a great week or weekender stay. An easy one-flight trip from most US cities, the resort is just 20-minutes away from the Liberia Airport, an area known as the Guanacaste region of Costa Rica. Matiss is the open-aired, oceanfront beach restaurant with casual dining and fresh seafood cuisine. A laid-back and chill setting, come barefoot and enjoy the toes-in-the-sand cocktails and dinner. Grab yourself a cup of delicious Costa Rican coffee. A display of fruit, eggs, breads and more are at the buffet, or order off the menu. Eat lunch and snorkel at one of the local favorite empty beaches, with a box lunch provided by El Mangroove. Nuts, fruit, sandwiches, cocktails, beer, all on order for your special castaway experience. Ginger Restaurant Bar is a quick ride outside of El Mangroove. A local’s place. Head to the beach shack on El Mangrove’s beach, where you can book a beach hopping adventure. Snorkel at some of the most beautiful Gulf of Papagayo spots and visit secluded beaches. Grab one of the 5 luxe cabanas and relaaaaaaaax by the 130-foot long pool. If sitting poolside doesn’t float, then head over to the activities center beachside and grab a kayak or standup paddle board, or even experience Papagayo Bay with the resort’s boats. Getting back from adventures and ready to eat? Order the fresh catch of the day’s ceviche. El Mangroove’s culinary philosophy. “We call this philosophy “makoko”, because a gastronomical experience isn?t confined by language and a savory dish on a table; it includes well-being, versatility, artistry and personalized attention. If good food is the way to the heart, Makoko is the scenic route,” says the site. The hotel boasts 85 rooms, pool, activity center, three restaurants, two bars, a shop, gym, and spa. It’s the ultimate place to get to and just relax, but with lots of things to do and see for those looking for adventure. An hour outside El Mangroove, Rincón de la Vieja Volcano National Park offers treks to waterfalls, mud baths and a natural thermal hot tub. Don’t miss: the zip line adventure, which takes you past cliffs, jungle, and includes a swing and rock climbing wall. Head out on bikes to explore the area beyond El Mangroove, or enjoy the afternoon fishing. There are also sunset tours, whale and dolphin excursions, and a gym. 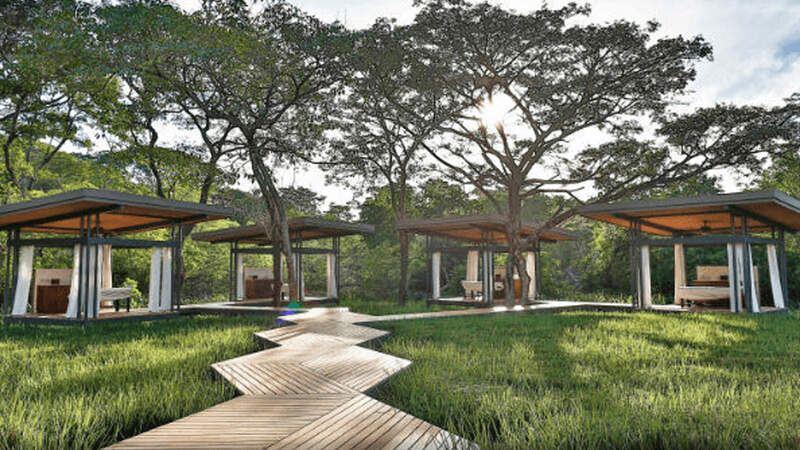 Or, Bearth Spa on property offers up a bevy of natural treatments, such as their signature Volcanic Massage using heated stone, or book massage in outdoors in the cabanas, where tree monkey’s sing along with chirping birds, creating an unforgettable and relaxing experience.